I had just returned from a two-week trip to the UK. Although fresh produce is plentiful in the markets, salads and fresh vegetables don’t seem to find their way very often to British restaurant menus. I was seriously craving some greens. Additionally, I had cleared my kitchen of any fresh produce before my trip. We cooked and ate what we could and gave the rest away to friends, to avoid coming back home to a moldy refrigerator. However, in my freezer I found a bag of frozen spinach. In my refrigerator was a lonely, overlooked serrano pepper. And in my cupboard was a jar of my Sunday morning breakfast staple – grits. I’ve always loved creamed spinach on toast or over rice. 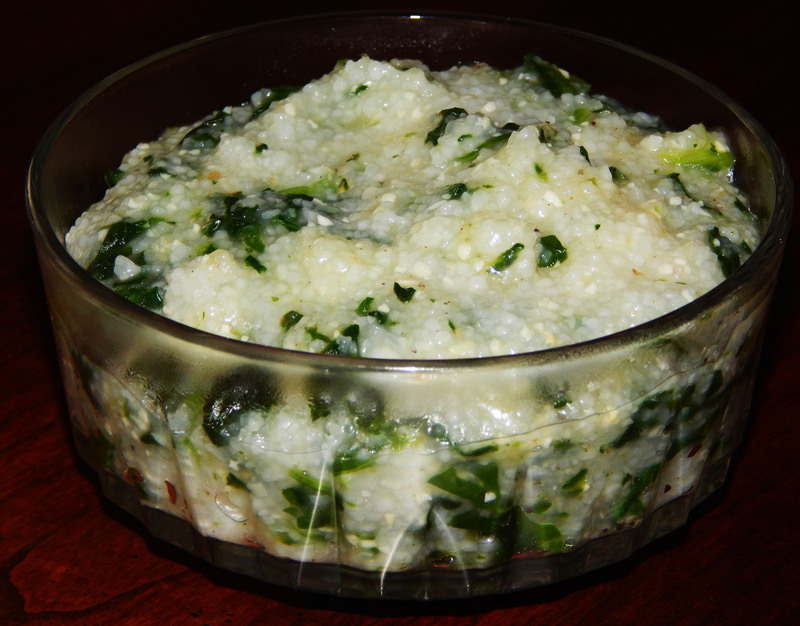 So why not combine spinach with grits for a creamy, savory breakfast? Add grits, salt, and serrano chili pepper. Reduce heat to low and stir to make sure lumps don’t form. Add Earth Balance and stir until melted. Add frozen chopped spinach and nutmeg. 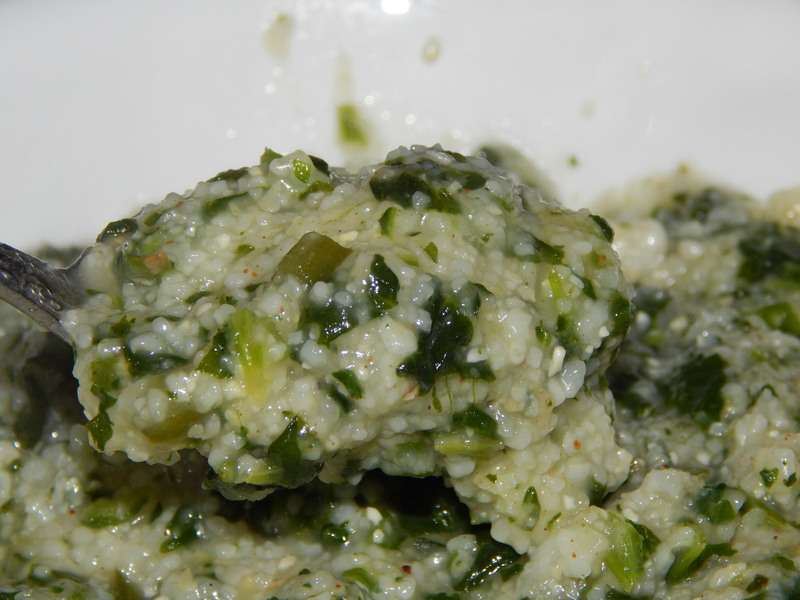 Cook for about 15 – 20 minutes, or until grits thicken. Taste – you may need to add more salt or nutmeg. If it’s not quite creamy enough, add a little more Earth Balance. Give it a good grind of black pepper and serve. 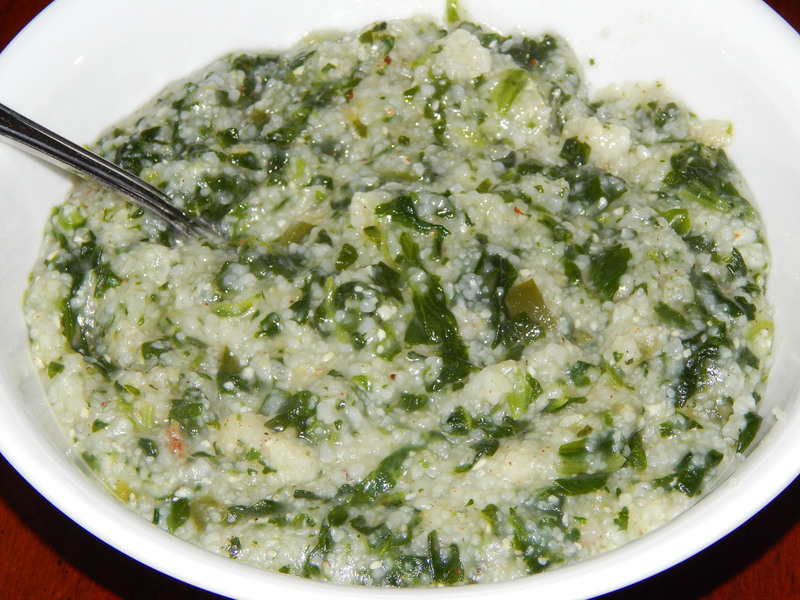 I like spinach and I like grits but never ever thought of combining the two. Now you’ve got my wheels turning thinking of other possible combinations with my grits. Mavis, I never thought of combining the two, either … until I was craving some greens and there wasn’t much in the house! I really liked the way it turned out, though, and I made it again. If you think about it, grits are (is?) just a grain, so technically we should be able to use similar combinations as with rice, couscous, quinoa, etc. Please let me know if you come up with another good combination!